Designed as a hub for interdisciplinary arts and collaboration, Brown University’s zinc-clad Granoff Center is arranged around an atrium. ‘Living room’ lounge spaces spin off the six split-levels cross the central space. Media labs, recording studios and classrooms weave into the program. In a signature DS+R move, the 218-seat auditorium is viewable and digitally networked to the exterior amphitheater, allowing for video projections to stream simultaneously inside and out. Brown University is now the proud owner of a new Creative Arts Center that breaks the mold — literally. The LEED Gold facility by Diller Scofidio + Renfro is a three-floor multi-disciplinary building that is split in half to create six floors connected by vision glazing. The result is an interactive arts center that incorporates chance interactions as a part of the creative process. Diller Scofidio + Renfro is used to breaking the design mold with project such as the Highline Park, Boston’s ICA, and the Lincoln Center remodel — so their unique interpretation of a the new creative arts space should come as no surprise. The space hosts multiple disciplines ranging from a dance studio, to video production, a theater, and a technology center. Interdisciplinary projects are a core message in the building’s design. The levels are broken in half, so each transition has access to the floor above and below with plentiful breakout spaces. 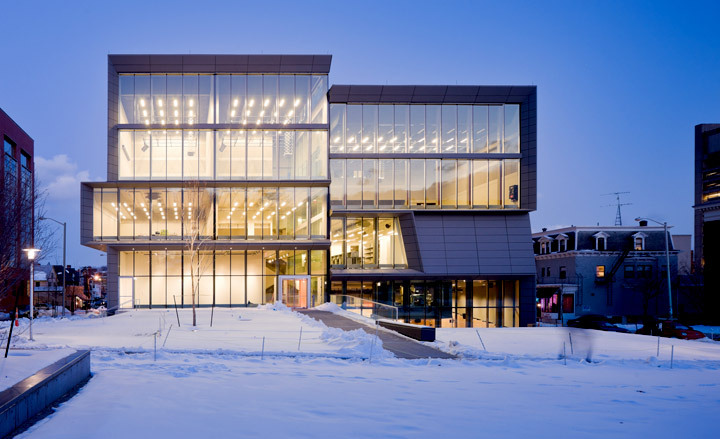 The education center’s ample daylighting and vision glazing opens the building to the street and creates a stimulating environment for experimentation with new forms of expression. The 35,000 square foot facility incorporates radical, subtle and unexpected elements in its re-orientation of an education and arts program.